Fall of 2005 some of the students from Big Rock Sudbury School came up to see the start of the new 36 KW wind turbine. More then one truck load of concrete per 20 foot deep hole. The kids in Devil's Gulch Ranch Summer Camp put the tower together like a gigantic Erector Set. The camp kids did a great job painting the prop. After a good torque of the bolts a large crane lifted it into place. Our friend Simon helped us with some minor repairs of the prop along with countless other tasks. Wind Power at Devil's Gulch Ranch is a Reality! Our camp director and a consultant climbed the 80' tower and bolted the 10000 pound unit onto the tower. This is the first large wind turbine to be erected in Marin County. When the wind is blowing it produces about 35 KW of power to supplement the power used by the ranch. The best we can tell is Devil's Gulch got the name well before the ranch was formed. Devil's Gulch was the passageway between Nicasio Valley and Paper Mill creek. The local history seems to indicate that the gulch could have got its name because of how treacherous this important trail was, or because of the devilish screams of the mountain lions native to the area. 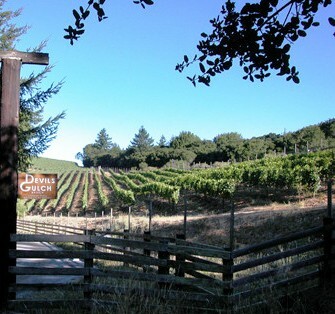 In 1864 Devil's Gulch ranch (873 acres) split off from a larger parcel and was purchased by two Martinelli Brothers, Union Army Civil War officers using their wages to start fresh in California. The main barn built in 1867 is still in use today. It was part of the dairy farm selling cream while the skim milk went for the production of pork. The ranch was passed on from heirs to heirs until 1969 when John Moreda sold the ranch to a developer who split the ranch into parcels. In 1971 Mark Pasternak purchased the heart of the ranch (65 acres), moved there, and began the creation of the ranch as it is today. The remainder of the 873 acres was purchased by other individuals, and was subsequently purchased by the federal government in 1980, and is now part of the Golden Gate National Recreational Area. Mark was joined by his wife, Myriam in 1987 and their two daughters, Lydia and Kyla, thereafter. Mark and Myriam’s combined agricultural experience totals more than 80 years (including Myriam’s large animal veterinary degree from UC Davis).